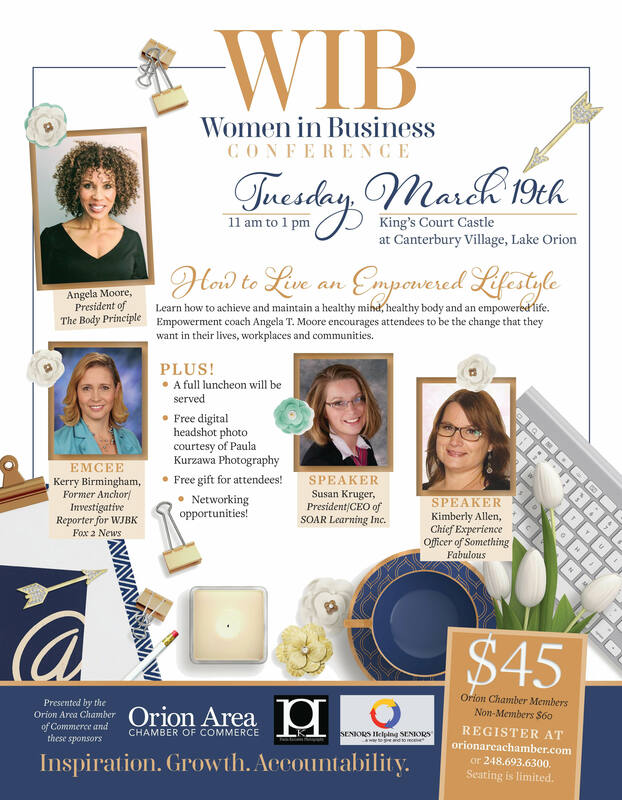 Join the Orion Area Chamber of Commerce on Tuesday, March 19th, for the Women in Business Conference. Keynote Speaker Angela Moore presents "How to Live an Empowered Lifestyle." The essential components of an empowered lifestyle include nutritional, mental and physical health. Learn how to achieve and maintain a healthy mind, healthy body and an empowered life. Empowerment coach, Angela Moore encourages attendees to be the change they want in their lives, workplaces and communities. Guest Speaker Susan Kruger, SOAR Learning Inc. and 2014 Oakland County Elite 40 Under 40 winner, will share her success story and discuss who inspired and empowered her during her journey. Guest Speaker Kimberly Allen, Cofounder and Chief Experience Officeof Something Fabulous is an event professional committed to changing the conversation around the way we as organizations and individuals plan, manage and execute events, parties and milestone celebrations. Whether it is a 500 person gala, backstage VIP area, corporate launch party, or an intimate dinner party at home, she is passionate about integrity, authenticity and engagement on every level of Experience Design. Emcee Kerry Birmingham is a seasoned communications and strategic planning professional who loves telling great stories. She has a strong belief that everything we do—in our work and person lives—is about people, and our impact on the people around us. With a background as a broadcast journalist, she knows that authentic personal narratives can shape the reputation of a business, organization, cause or event.